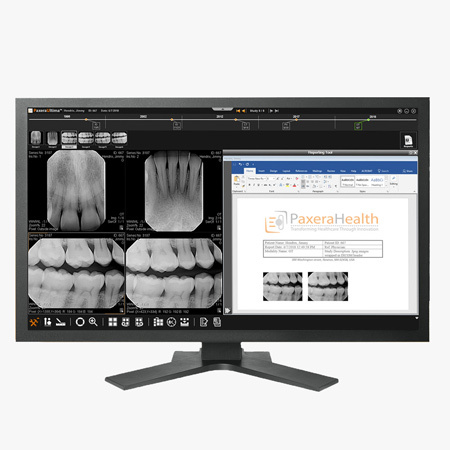 PaxeraDental is a comprehensive and easy to use PACS solution for displaying dental images online. The solution features extensive hanging protocols, including various predefined and customizable FMX template modes. The incorporated hanging protocols enable users to automatically display digital radiographic images on one or multiple monitors. The images show intraoral, panoramic, and cephalometric views generated during examinations. PaxeraDental supports all DICOM modalities and features a full spectrum of diagnostic and reporting tools. PaxeraDental has extensive radiographic dental projections including periapical, bitewing, occlusal, panoramic and cephalometric views. The module has an embedded zero footprint viewer for all mobile devices and browsers. The solution also conforms to ISO 3950 tooth notations and acquires intraoral, conebeam, cephalometric and panoramic X-ray images. The module’s dental charts are built to accelerate workflow. Set them up easily for periapical views. The module supports both permanent and deciduous dental charts. Have the ability to change dental notations of charts with a couple of clicks. Choose from an extensive library of FMX templates which includes FMX 14,16, 18, 20, 10, 12 (Child), 8 (Decidious) and 4 (Bitewing). Every template is customizable with interactive visual tools. Have the ability to capture current displays as new templates. The PACS system is integrated with Cybermed’s OnDemand 3D solution which offers complete 3D visualization with advanced 3D rendering technology. 3D zoom and segmentation allows you to see every detail in your images. Planning surgeries is made simple with the built-in implant planning solution.